Dr. Daniel Esper attended the College of the Holy Cross in Worcester, MA where in graduated in 1982 with a Bachelor of Arts degree. He received his Medical Doctor degree at SUNY Health Sciences Center in Syracuse, NY in 1986. Dr. Esper then completed his Internal Medicine Residency in 1989, followed by a Fellowship in Cardiology at Albany Medical Center in Albany, NY in 1992. 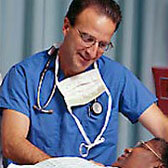 Dr. Esper in Board Certified in Internal Medicine and Cardiology. He is a Fellow of the American College of Cardiology and a Fellow of the Society for Cardiac Angiography and Interventions. Dr. Esper is also a member of the American College of Physicians. He is on staff at St. Peter’s Hospital, Albany Medical Center, and Albany Memorial Hospital in Albany, NY. Dr. Esper is a Senior Interventional Cardiologist for Capital Cardiology Associates, PC. Dr. Esper’s cardiology specialties include general cardiovascular disease with a special interest in invasive and interventional procedures, including cardiac catheterization, coronary angioplasty, coronary stenting, intravascular ultrasound, FFR- fractional flow reserve, rotational atherectomy, and angiojet thrombectomy. He is now capable of performing balloon aortic valvuloplasty..
Dr. Esper is married to Sarah Reed-Esper, MD. He resides in Slingerlands, NY. When he is not practicing cardiology, Dr. Esper enjoys coaching soccer, Telemark snow skiing, hiking and mountain climbing, and being Dad to three great children and married to his wonderful wife.